Amoebophrya sp. Gunsan S. Kim and Park, M. Gil, “Amoebophrya spp. from the Bloom-forming Dinoflagellate Cochlodinium polykrikoides: Parasites not Nested in the “Amoebophrya ceratii Complex””, Journal of Eukaryotic Microbiology, vol. 61, no. 2, pp. 173 - 181, 2014. Amoebophrya sp. Jinhae Bay S. Kim and Park, M. Gil, “Amoebophrya spp. from the Bloom-forming Dinoflagellate Cochlodinium polykrikoides: Parasites not Nested in the “Amoebophrya ceratii Complex””, Journal of Eukaryotic Microbiology, vol. 61, no. 2, pp. 173 - 181, 2014. Amoebophrya ceratii-Clade-4 Kusuan S. Kim, Park, M. Gil, Yih, W., and Coats, W. D., “Infection of the bloom-forming thecate dinoflagellates Alexandrium affine and Gonyaulax spinifera by two strains of Amoebophrya (Dinophyta)”, Journal of Phycology, vol. 40, no. 5, pp. 815 - 822, 2004. 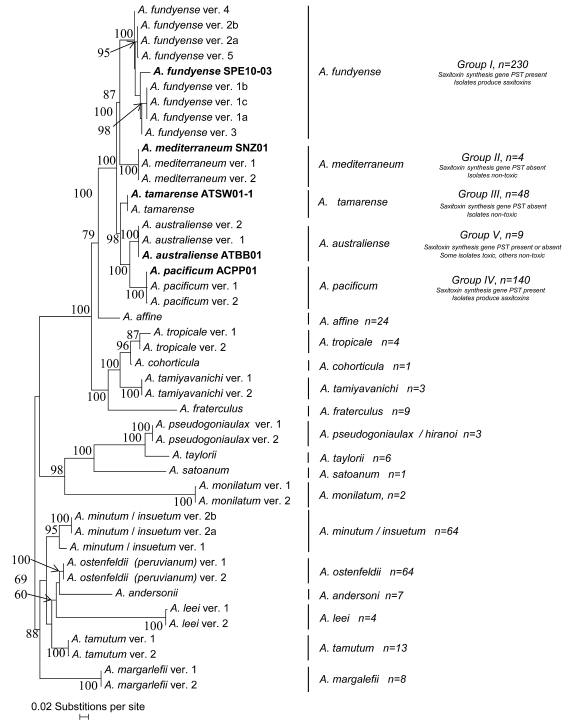 Amoebophrya ceratii-Clade-4 Kusuan S. Kim, Park, M. Gil, Kim, K. - Y., Kim, C. - H., Yih, W., Park, J. Soo, and Coats, W. D., “Genetic Diversity of Parasitic Dinoflagellates in the Genus Amoebophrya and Its Relationship to Parasite Biology and Biogeography”, Journal of Eukaryotic Microbiology, vol. 55, no. 1, pp. 1 - 8, 2008. Parvilucifera sp. Catalunya Harbor of Tarragona M. Delgado, “A new species of Gymnodinium that caused the 1998 summer human respiratory syndrome and decimation of marine life in Wellington Harbour, New Zealand”, Harmful Algae News, vol. 19, pp. 1-3, 1999.